A leading sourcing summit Intertextile Shanghai Apparel Fabrics wrapped up last month with a 15% increase in the buyer figure, attracting 82,314 visitors coming from 104 countries and regions. The show also hosted 3,386 exhibitors from 22 countries and regions at the National Exhibition and Convention Center. Strong growth was registered in buyers from Hong Kong, Korea, Japan and India – this edition’s top four countries and regions – while Italy and Bangladesh entered the top 10 list this year, in eight and tenth places respectively, alongside the US, Taiwan, Russia and the UK. “After the strong increase in the buyer figure at last October’s Autumn Edition and the generally favourable outlook of the global textiles industry in recent months, we were expecting a strong result this year, but the increased number of exhibitors and buyers placing their trust in this fair as their main business platform has completely exceeded our expectations,” commented Wendy Wen, Senior General Manager of Messe Frankfurt (HK). “This fair gives us a good overview of what’s happening in the market. We’re looking for a wide range of products, so the fair is good as it has a bit of everything. It’s good for researching new vendors, and you can always find new ones to work with,” commented one the buyers, Michelle Klein, Manager Fabric R&D, American Eagle Outfitters, USA. Seven halls were in use this spring, with everything from fabrics for ladieswear, menswear, suiting, shirting, lingerie and swimwear, to high-end wool fabrics, original pattern designs, functional and performance fabrics, sustainability products and services, digital printing technologies, garment and fashion accessories, and more on display. 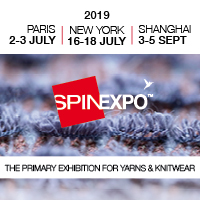 Growth areas this edition included the Premium Wool Zone, with the exhibitor number doubling from last year, reflecting the evolving use of wool in spring/summer collections. The international area of the Beyond Denim zone also doubled in size this year, while overseas presence in Accessories Vision grew by 73%. “Our target buyers are the very best, high-end bespoke tailors in China, and we’ve received many such tailors at our booth looking for high-end European suppliers. The majority of buyers have been from China, but we’ve also met people from India, Southeast Asia and even the UK. I believe the European presence in Intertextile is gradually increasing – not just the exhibitor side but also visitors,” commented Josh Lane, Regional Sales Manager, Far East, Holland & Sherry, UK, exhibiting at the Premium Wool Zone. Another exhibitor to share similar sentiments was first-time French lace exhibitor Jean Bracq. “We are here to promote our lace to worldwide markets,” said Philippe Larrieu, Responsible Commercial Export.